Barcelona is one of the most visited cities in Europe and every year, thousands of tourists wander the streets of the capital of Catalonia in search of art, culture, fun and somewhere to relax. The city lends itself perfectly to every need, sastisfying the widest possible range of interests and desires. Of course, there are less well publicised routes, or, at least, some very particular itineraries which are able to show the city off from a slightly different perspective. The best way to venture out in comfort, and without any stress, to visit these places is to put your trust in a car rental service with an experienced driver which will provide a service that is tailor-made for each client ensuring that even the most demanding of travellers will be more than satisfied. Choose the duration of your tour at the time of booking: fill out the form on this page and indicate your preference from a tour by car lasting two, four, six or eight hours. A driver will collect you directly from wherever you are staying (or anywhere else in Barcelona) and accompany you on a voyage of discovery of the city's most beautiful places. Choose to put your trust in a guide who knows the city like the back of his hand or, you can choose your own itinerary. In addition to this, you can request that the driver returns you to your accommodation at the end of the tour. The number of attractions that can be visited will vary according to the client's requirements. For example, if you would like to stop for longer at the Cathedral of the Holy Family in order to see inside or, simply because you would like to stroll around the gardens, the driver will wait for you in the car for however long you want. Obviously, this will shorten the visiting time at the next place on the schedule so that, in order to see as many attractions as possible, you would need to curtail the length of time spent at each stop. Visit everything you want! Visit Barcelona in complete comfort, thanks to experienced drivers who won't waste any time in getting you from your accommodation to the spectacular places you have chosen to see. 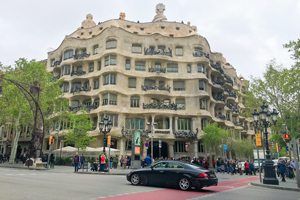 For example, would you like to travel the length of thePassèig de Gracia avenue admiring works by the famous Gaudí from the comfort of a car that is just for you and your family? Do you love watching the sunsets? Ask the driver to take you to Bunkers del Carmel or to Barceloneta. After dusk, you can choose to go straight to a restaurant for dinner or you may choose to visit other places such as: Montjüic Mountain, the Montjüic cable car, Mount Tibidabo and the famous stadium of Camp Nou (FC Barcelona). You can specify what you want to see on the booking form or, you can let yourself be guided by your driver's recommendations. The drivers all speak mainly Spanish and English. In any event, communication shouldn't be a problem as the drivers will know the planned itinerary in advance. Montjüic Mountain is situated closed to the commercial port, rises spectacularly above the entire city and is home to many of Barcelona's historic attractions such as the Poble Espanyol which is the recreation of a medieval Spanish village, Palau Sant Jordi which was used for sporting events at the Olympic games of 1992, Montjuïc Castle, the Olympic Stadium and the Museum of National Art of Catalonia. Just seeing these is enough to justify making the tour. In fact, without a car or a taxi, this area is more difficult to reach using public transport - unless you want to climb there on foot! But it doesn't stop here! Let's not forget about Tibidabo, which is also quite difficult to reach by public transport and also requires quite a climb if you are going there on foot! This is the name of a mountain of around 500 metres which also dominates the horizon of Barcelona and is home to an amusement park which is more than a hundred years old and is the second oldest in Europe after Vienna. There is also a church at the summit with a statue of Christ that is not dissimilar to the one in Rio de Janeiro. The church offers the use of a lift (which is chargeable) from which you can reach an altitude of 535 metres above sea level. And, to finish off, there is Camp Nou, the vast stadium belonging to one of the best known football clubs in the world, F.C. Barcelona. This facility can host up to 92,000 spectators making it the largest stadium in Europe and it is also home to the large museum which tells the club's history. This is an unmissable stop for sports fans or athletes from all over the world. In order to visit all the places which have been mentioned above, all you need to do is to book the "Tour of Barcelona" by filling out the form on this page. The Tour service which is available includes all the most panoramic and fascinating sights in Barcelona. It's really easy! Choose on the booking form, the most suitable itinerary for you. And to finish off, you have the option to personally select where to go and to organise the tour yourself, in fact, it is the client, (if you so wish) who can put together the travel package that they want. Visiting just the centre of Barcelona and doing so on foot will reduce the number of places that you are able to see and could mean missing out on so many iconic places that you can share with your friends and family when you get home as you won't have any photos to show them of the unforgettable places you have seen. So, what are you waiting for? Book your tour of Barcelona by car now! Available every day, subject to booking.